Denmark is one of the happiest countries in the world, according to studies and polls. 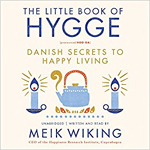 Meik Wiking, CEO of the Happiness Research Institute in Copenhagen, Denmark, believes that this is because the Danish people are obsessed with Hygge (pronounced HOO-GA), a sense of comfort, togetherness, and well-being. They create an atmosphere of Hygge in their homes and workplaces, seek out Hygge experiences, celebrate Hygge moments. In the simple and forthright book, “The Little Book of Hygge: Danish Secrets to Happy Living” (2017), Wiking shares the principles of Hygge and how we can bring Hygge into our lives. Each chapter focuses on ways to bring Hygge into our lives, such as the use of light (candles, soothing pools of light) and small gatherings to comfort food and casual clothes, illustrated with cozy, colorful drawings. “The factor that has the biggest effect on our happiness is social support,” Wiking declares. Or put another way, “The best predictor of whether we are happy or not is our social relationships.” He highlights Denmark’s healthy work-life balance, a slower pace of life, free healthcare, free university education, and five weeks of paid holidays per year. Wiking also includes polls and studies to backup the science of Hygge, as well as recipes, a Hygge emergency kit, and even directions to make woven heart decorations. Atmosphere. Turn down the lights. Presence. Be here now. Turn off the phone. Pleasure. Coffee, chocolate, cookies, cakes, candy. Equality. “We” over “me.” Share the tasks and the airtime. Gratitude. Take it in. This might be as good as it gets. Harmony. It’s not a competition. We already like you. Comfort. Get comfy. Take a break. It’s all about relaxation. Truce. No drama. Let’s discuss politics another day. Togetherness. Build relationships and narratives. Shelter. This is your tribe. This is a place of peace and serenity. For me, the best Hygge tip is to link what you buy with good experiences. For example, save money to buy something you really want, but wait until you have something to celebrate, so that you will be reminded of it every time you use it or remember it. Denmark has cold winters, rainy days, and an abundance of darkness. Candles, lamps, fireplaces, warm sweaters, woolen socks, and hot soup can warm you inside and out. Hawaii, with its tropical weather, refreshing breezes, and abundance of sunshine is almost the complete opposite of Denmark. What does Hygge mean to us in Hawaii? Could our ceiling fans, open lanais, tank tops, board shorts, slippers (flip-flops), scent of plumeria, and shaved ice, as stereotypical as they may be, reflect a Hawaii concept of Hygge?